These Apple Cinnamon Cheesecake Cups combine two of my absolute favorite desserts into creamy, flavorful, perfectly portioned dessert cups ideal for fall. I love cheesecake and I love apple pie, so these rich cinnamon cheesecake cups topped with sweet homemade apple pie filling are like a dream come true. I can hardly believe each one is only 118 calories or 5 Weight Watchers SmartPoints! These cheesecake cups are super easy to make and a perfect way to celebrate fall. They’d be great at a Thanksgiving or Friendsgiving meal or as a sweet treat at a football viewing party or book club meeting. If you’re looking for a creamy, fruity and comforting dessert this season, these Apple Cinnamon Cheesecake Cups are for you! If you want to see more perfectly portioned sweet treats, check out my dessert category for favorites like Chocolate Chip Cannoli Cups, Key Lime Cheesecake Cups, Mixed Berry Mini Tarts, Carrot Cake Cupcakes, Cheesecake Stuffed Strawberries, Dark Chocolate Orange Cupcakes, Mini Cinnamon Apple Tarts, Berries & Cream Cinnamon Dessert Cups and more! Preheat the oven to 375. Place cupcake liners into 12 cups of a standard sized muffin/cupcake tin and place a Nilla wafer in each liner. In a large bowl, combine the cream cheese, yogurt, 1/3 cup of sugar, egg, vanilla extract, lemon juice and cinnamon and mix together using an electric mixer until smooth and well combined. Spoon the mixture evenly on top of the wafers into the prepared liners and spread flat with a spatula or the back or a spoon. Bake for 15-16 minutes and remove from oven to cool. Once the cheesecake cups have cooled to room temperature, transfer the cheesecake cups to the refrigerator and chill for at least one hour. In a small saucepan, bring the butter to medium heat until melted. Add the chopped apples and stir to coat. Cook uncovered for 4-5 minutes, stirring occasionally. In a small dish, combine the sugar, cornstarch and cinnamon and stir together. Pour the sugar mixture and the water into the pot with the apples and stir to combine. Cover the saucepan and reduce heat to low. Simmer for 3-4 minutes until the mixture is thick and apples are tender. 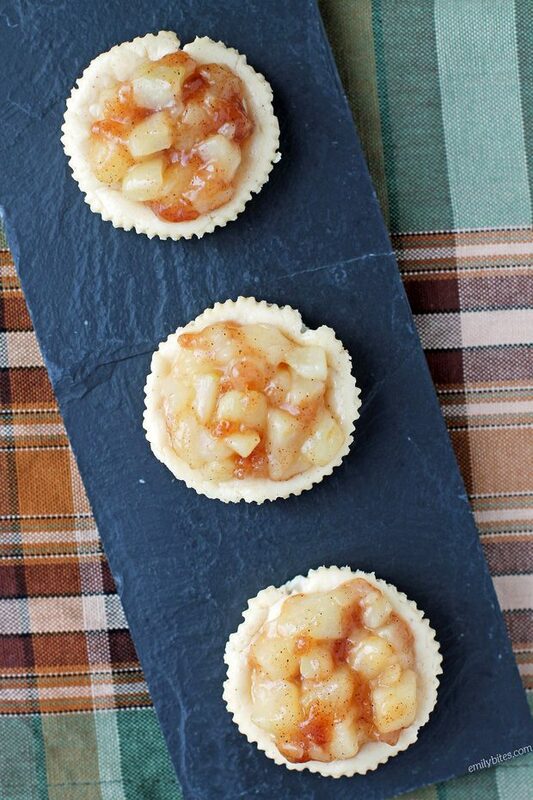 Top each cheesecake cup with about a tablespoon of apple topping and serve. Oh my gosh, yum! I’m going to make these bad boys for my sister’s birthday this Sunday! These were great. Enjoyed by my parents as well. I just made these and my whole house smells AMAZING! They were actually super easy to whip up & cant wait till they’ve cooled so I can try!! These single serving cheese cakes look so decadent. 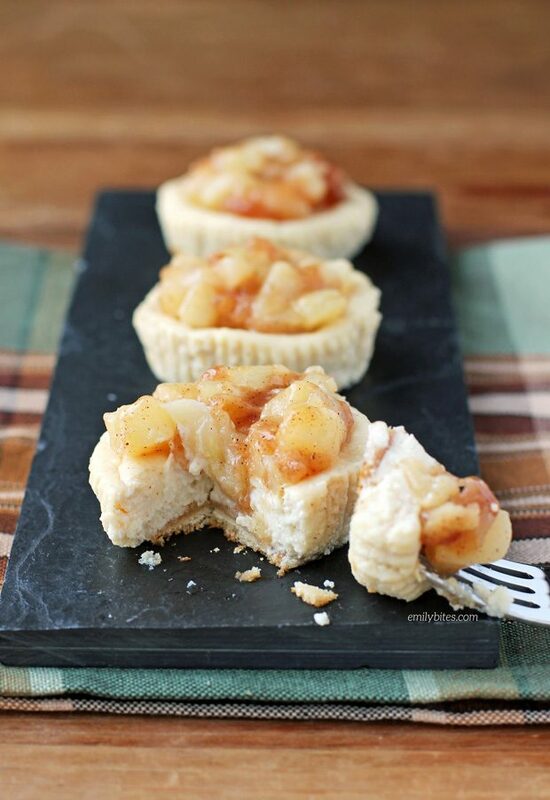 I love the different layers and textures created with the cheese cake base and the stewed apple topping and the flavors blend so well together too.